With my continued goal of running in the ING NYC Marathon, I signed up for seven races for my eligibility for the 2012 marathon before joining the American Cancer Society’s team for the 2011 marathon. As I train for the 2011 marathon, I will be running these races to run it in 2012. 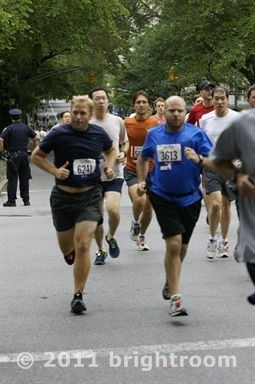 The first of my seven races was this past Saturday, when I ran the Fifth Avenue Mile. 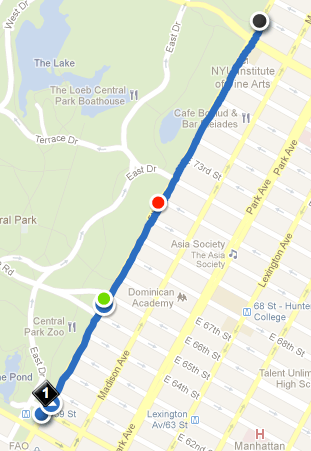 A straight run down Fifth Avenue in New York City, from 80th Street to 60th Street. With the exception of a minor dip along the route, the run is fairly flat and isn’t much of a challenge runningwise. And with the race only being a mile, there’s no need to hold back, like one would in a longer race. I arrived a little after 8, where I saw Peter Shankman and Jasmine Decarie, who were running in the media heat, which started the day. After their run began, the heats were every 15 minutes and segmented by age and gender. Children as young as 8 and adults as old as 79 ran the race the course, with my group running at 10:30am. With the shot of the gun, we were off. Following the truck showing us the timing, we ran down the street, a mass of people swarming down Fifth Avenue as people cheered us on from the sidewalk. Just as the race was starting, the 1/4 mile marker looms, echoing how succinct this race was compared to the others I have run. A scant 6 minutes and 49 seconds later, I passed the finish line and completed my race, and brought down my average mile time for official races. My goal time for the race had been 7 minutes, so I was glad to beat it by 11 seconds. With this race completed, I need to complete another six races and volunteer to help with one in order to have automatic entry into the 2012 New York City Marathon, which I look forward to running in next year.